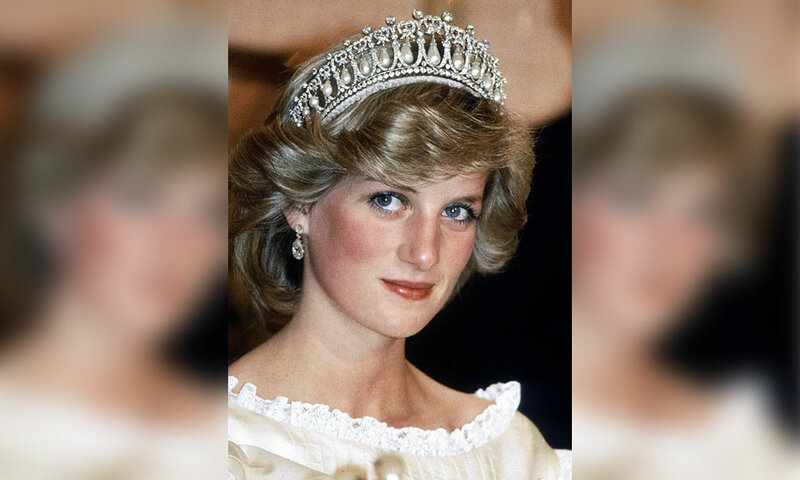 From being born Lady Diana Spencer to becoming the Princess of Wales, Diana became one of the most revered global figures during the ’80s and ’90s. Known as the “People’s Princess,” Diana was always humbled to meet the public through her royal tours and work with charity organizations. After the scandal of her broken marriage to Prince Charles, Diana became even more of a spectacle as paparazzi worked hard to catch her in a bad light. While it couldn’t be done, there are plenty of photos of her that never made it to public eyes… until now! 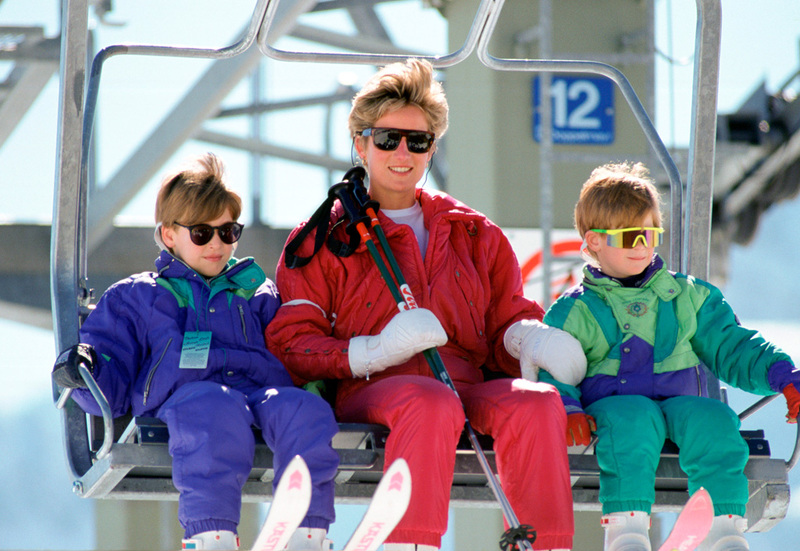 Princess Diana took her sons on their very first ski trip to Lech, Austria on April 10, 1991. Prince William was eight years old, while Prince Harry was six. Lech was one of many ski destinations the Royal Family loved to visit. In 1991, Princess Diana’s relationship with Prince Charles was irrevocably broken as both of them had by then engaged in extramarital affairs. Diana was very unhappy and allegedly suicidal, which became a huge concern in the tabloids. At least Diana had ski trips like this to take her mind off it all. 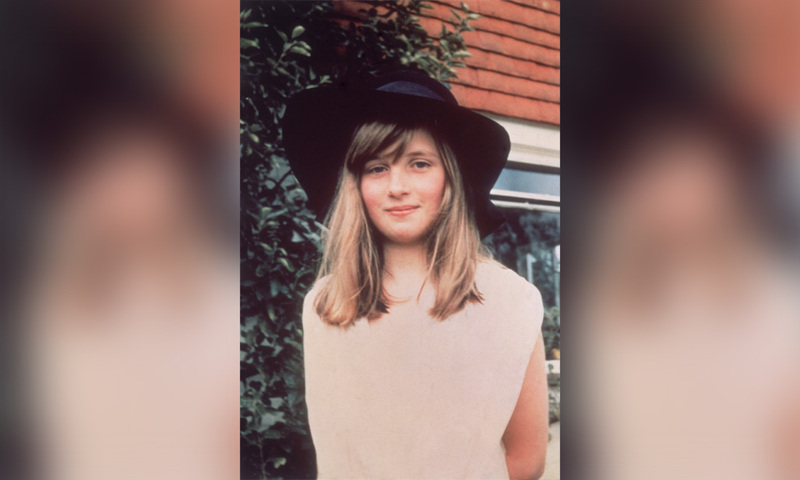 Lady Diana Spencer was a stylish, but modest, teenager working low-paying jobs throughout London in the late ’70s and ’80s. Here, Diana is seen getting into a car outside of the flat her mother purchased for her in Coleherne Court for her 18th birthday in 1979. By this time, she was already in the works to be courted by Prince Charles, whom she had met while he was dating her older sister, Lady Sarah. This photo was taken in 1980, the same year that Charles brought Diana to meet his family at their Balmoral residence. Princess Diana is best remembered for her good works and frequent involvement with charities across the globe. One such example was HALO Trust, a British charity and American non-profit that worked to remove debris and landmines from war-torn areas. 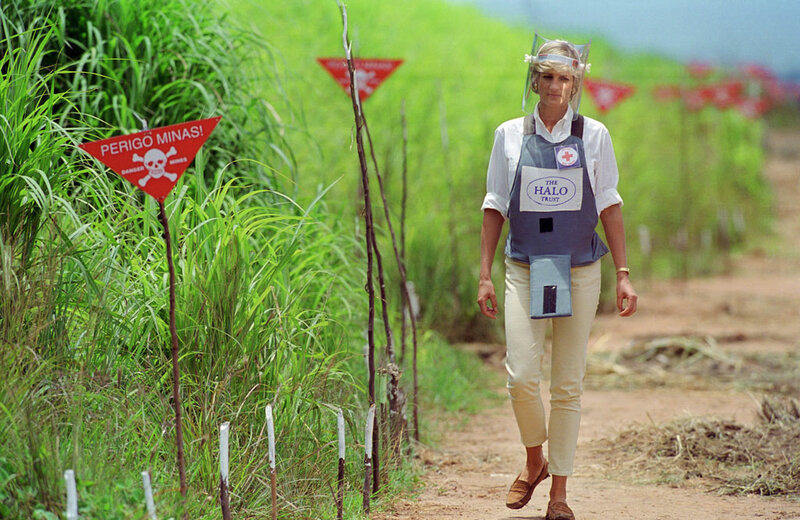 In 1997, photos of Diana visiting an Angolan minefield in a ballistic helmet surfaced, which caused politicians to accuse her of meddling in politics. But HALO stated that Diana’s efforts brought awareness to their cause. While she was there, she took the time to get to know some Angolan victims at an orthopedic workshop, as depicted in this photo. It seems Prince Harry’s always had a “wild side.” Harry stuck out his tongue for photographers, much to the surprise of Princess Diana. They’re seen in this photo with Prince William, Lady Gabriella Windsor, and Lady Rose Windsor on a balcony at Buckingham Palace. 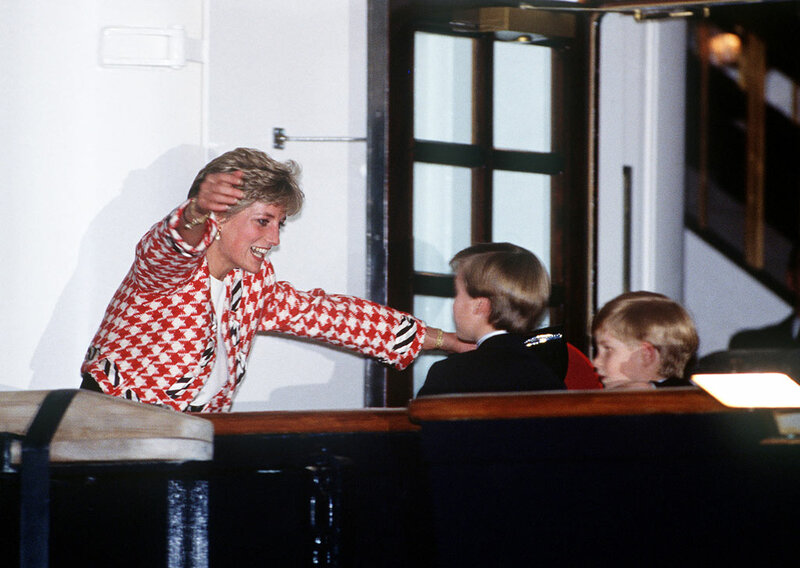 Princess Diana was known to be very hands-on with her sons, which was contrary to the way things have been run in the royal family for generations. She didn’t refer to Prince Charles or any other family member for help, she chose the boys’ first names, and she also dismissed the royal nanny for one of her choosing. But after Diana’s marriage to Prince Charles had collapsed, she reportedly reconciled with her stepmother and they were on good terms until Diana’s death in 1997. Here they are that same year at an charity auction. Later in her life, Diana began dating Dodi Fayed, the son of Egyptian billionaire Mohamed Al-Fayed. The summer of 1997, Diana accepted Fayed’s invitation to vacation with his family in the south of France, after the Royal Protection squad decided Fayed’s security was enough to keep her safe. Fayed’s father even purchased a multimillion-dollar yacht to entertain Diana and her sons. This photo from July 17, 1997 depicts Diana and Dodi enjoying their time on the yacht in St. Tropez – a little over a month before they would both be tragically killed in that infamous Paris car crash. 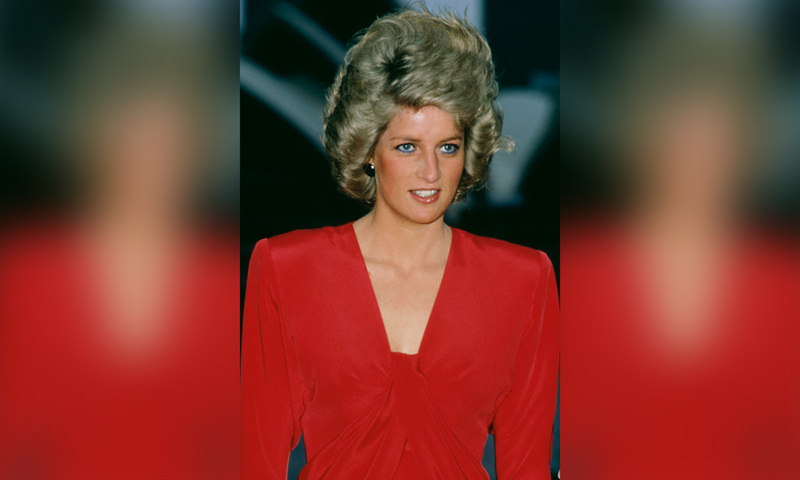 Throughout much of her public life, Diana was revered as a style icon. But through her outfits and daring makeup looks, one thing that seemed to stay relatively the same was her hair. Diana was known for her perfectly coiffed, ashy-blonde short hair. Sometimes her signature pixie-length hair would be blown out in a way that was popular for the late ’80s, like this photo of her in Australia from 1988. Diana was very secretive of her haircuts, getting little by little done over several weeks so that the media didn’t notice and it wouldn’t distract from her charity work. In 1990, Diana was often busy traveling with Prince Charles. They toured Nigeria and Cameroon, where Diana visited hospitals and supported women’s development projects. 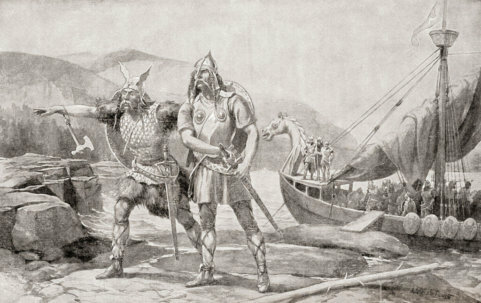 They also visited Hungary and Japan. But amid all her royal duties, Diana still took time to spend time with her family as evidenced by this vacation photo from April of that year. Here, Diana is stylish in a leopard-print bathing suit as she watches Prince William and Prince Harry bury her in the sand at the beach on Necker Island, in the British Virgin Islands. Hunter rain boots have become all the rage in recent years, but of course Diana was way ahead of the trend in 1981. 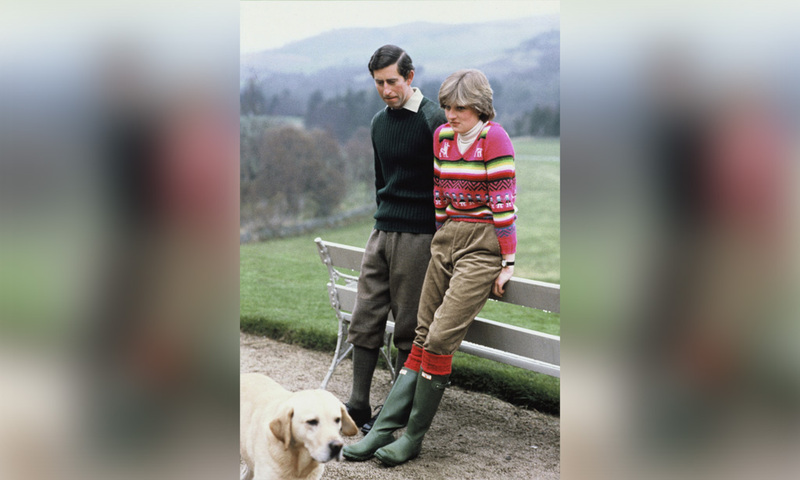 These boots were perfect for her to wear as she strolled the grounds of the Royal Family’s estate at Craigowen Lodge with Prince Charles and his yellow Labrador. This photo was taken on May 6, 1981, just a few months before she became the Princess of Wales. Diana gave up her job as a kindergarten assistant before marrying Prince Charles at age 20. She was the first royal bride to have a paying job before her engagement. Diana’s first pregnancy was announced shortly after marrying Prince Charles. Prince William was born on June 21, 1982, and Prince Harry was born two years later on September 15, 1984. The Princess has said that she and Charles were closest during her second pregnancy. 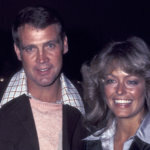 However, media reports suggest that their marriage started crumbling about five years in, which is when this photo was taken on July 14, 1986. They obviously show no signs of that here as they smile in a meadow outside of their Highgrove House residence. On June 18, 1997, Princess Diana was seen in the Bronx borough of New York City with the iconic Mother Teresa. 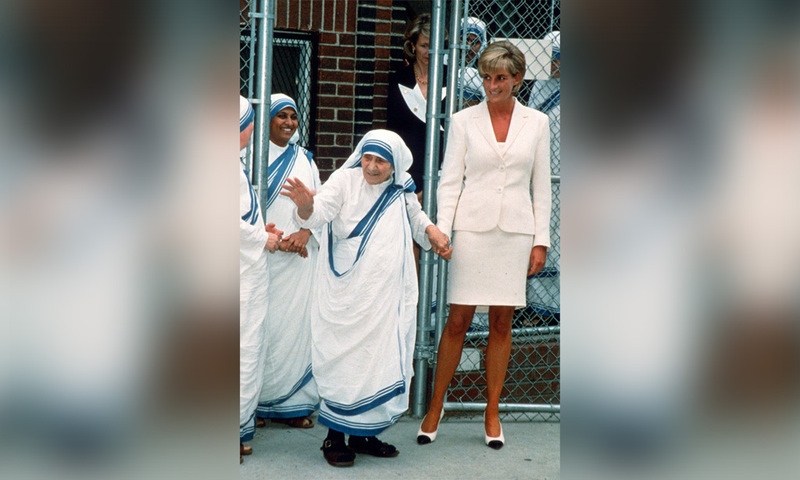 Diana visited Mother Teresa’s Hospice in Calcutta, India back in 1992 and she maintained a friendship with the saint ever since. Upon Diana’s death, Mother Teresa sent a message that read: “She was very concerned for the poor. She was very anxious to do something for them, and it was beautiful. That is why she was close to me.” Mother Teresa passed away just six days after Diana’s fatal accident. 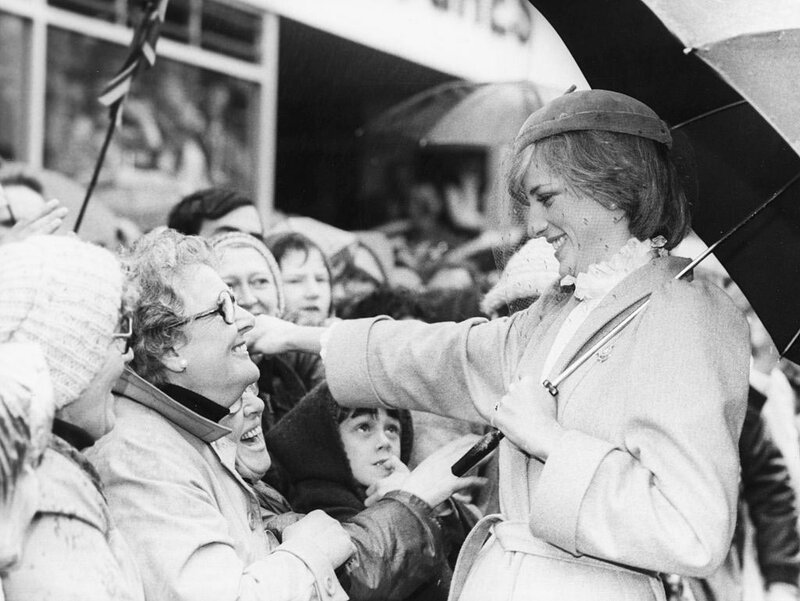 Diana was known around the world as the “People’s Princess” because of the way she consciously interacted and bonded with members of the public that she encountered. In 1988, she became a patron of the British Red Cross, whose symbol she wears on her shirt. She didn’t hesitate to hold and care for this baby that she met while visiting landmine survivors in Angola. 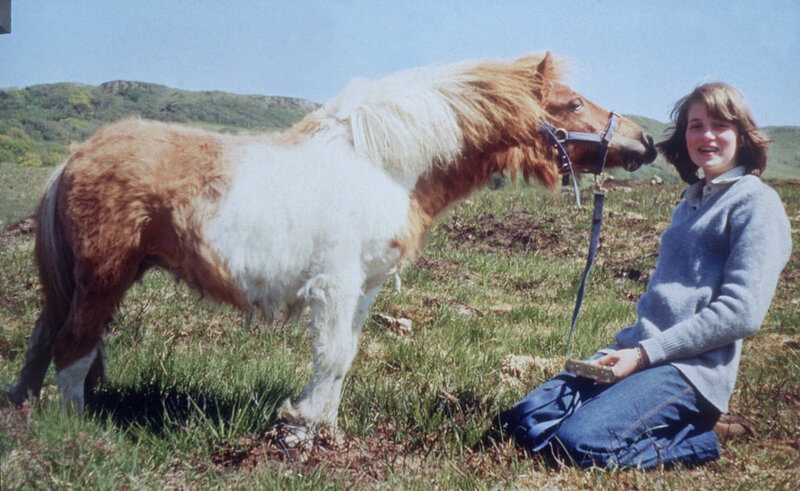 Shortly before her passing in 1997, she traveled to Washington, D.C. to help the American Red Cross promote their own landmines campaign and subsequently traveled to Bosnia with the Landmine Survivors Network. Coming up, you’ll get a sense of Diana in her youth and how she was as a kid. Diana knew that Prince William and Prince Harry had incredible lives ahead of them. One way she defied royal tradition was by deliberately giving her sons “normal” childhood experiences that they wouldn’t have otherwise as heirs to the throne. She let them eat McDonald’s and ride the bus, and even went so far as to take them to school herself as much as possible. 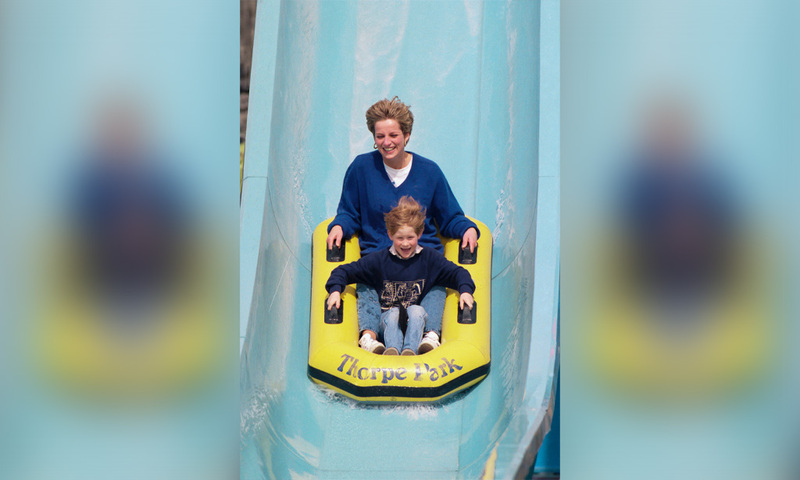 On April 18, 1992, she took them to English theme park Thorpe Park and rode all the rides with William and Harry. She even requested that staff treat them like regular guests and was willing to wait in lines! Diana looks thoughtful as she waits by a car following a polo match in Windsor after the Ascot races on June 16, 1981. 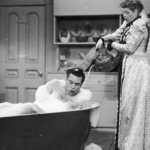 Perhaps she was having cold feet – or maybe she was bottling excitement – as she was due to wed Prince Charles a month later. She would go from Lady Diana Spencer to Diana, Princess of Wales after a whirlwind engagement that lasted just five months. We’d be nervous too if we knew we were about to marry into one of the most prominent families on the planet! 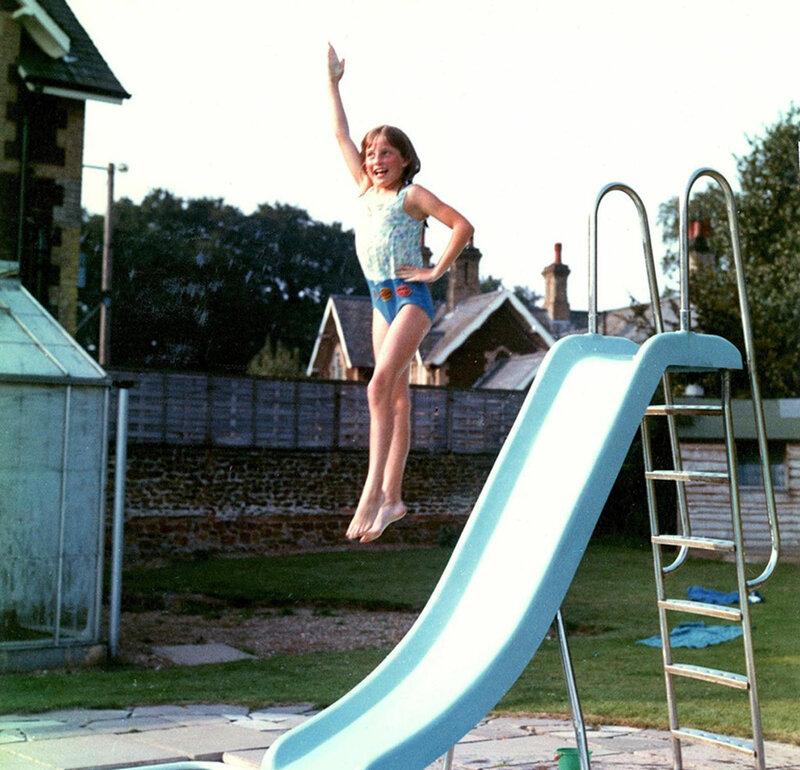 This is a photo of a young Diana Spencer taken on vacation in West Sussex during the summer of 1971. She was around ten years old in this photo. She grew up in Park House on the Sandringham Estate, which her parents leased from Queen Elizabeth II herself. Diana was initially home-schooled, but by the time this photo was taken she started attending an all-girls boarding school called Riddlesworth Hall School. Throughout her youth, Diana was a talented pianist, swimmer, diver, and dancer in ballet and tap dancing. One of her jobs as a young adult was a youth dancing instructor. Diana was spotted arriving at St. Mary’s Hospital in Paddington on March 1, 1989. It seemed that the paparazzi we’re always there to capture the latest on Diana’s whereabouts. The paparazzi still try to hound the royal family today, but perhaps no one had it worse than Diana – especially after her acrimonious split from Prince Charles. During an official visit to Hungary in May of 1990, Diana arrived at a state banquet at the Parliament Building in Budapest wearing an incredible strapless dress by designer Catherine Walker. The French designer’s label has become synonymous with Princess Diana’s style ever since they met in the early ’80s. 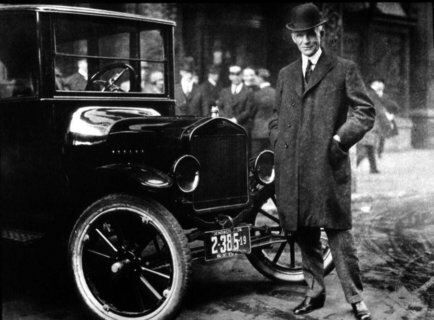 The brand is largely responsible for the modernization of royal style in general. Princess Diana and Prince Charles were visiting Hungary in what was the first official visit by members of the Royal Family to a “Warsaw Pact” country. 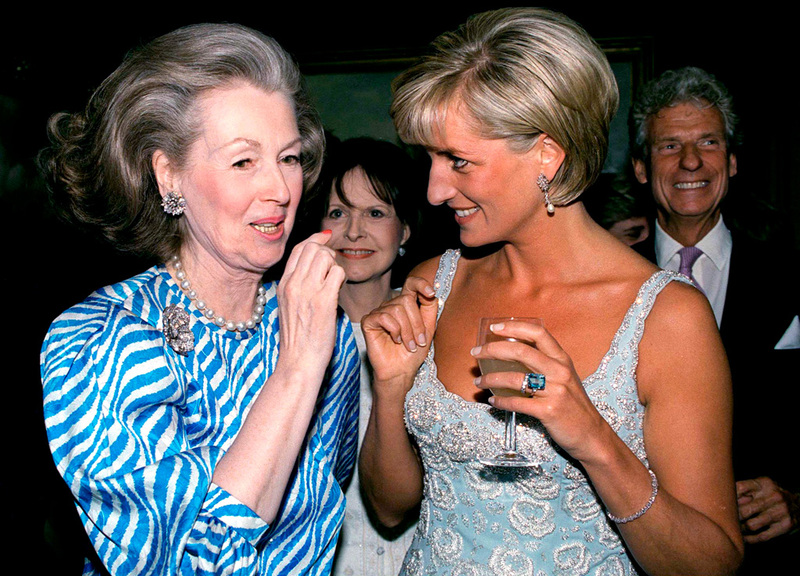 Diana certainly dazzled all of them. In June 1994, Diana arrived at a party hosted by Vanity Fair in what became known as her “Revenge Dress.” Designed by Christina Stambolian, the slinky black dress was form-fitting and off-the-shoulder – which was completely against royal protocol. However, Diana had good reason to go out in public on this day. That same night, a tell-all documentary premiered on television that was supposed to put Prince Charles in a sympathetic light following the announcement of his separation from Diana. However, he pretty much confessed to committing adultery on camera, which only made people more sympathetic to Diana. In November 1986, Princess Diana and Prince Charles visited Saudi Arabia, where they attended a picnic in the desert near Riyadh. Dressed in a Catherine Walker design, Diana enjoyed the company of the Saudi Royal Family that hosted the Prince and Princess of Wales in a Bedouin tent. While there, Princess Diana and Prince Charles watched horse races and visited Riyadh’s historic Masmak fortress. Princess Diana personally visited a home for handicapped children. 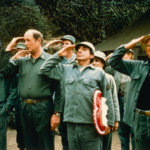 This was on the last leg of the Middle East tour that they took during the ’80s. A true princess of the people, Diana didn’t consider herself too good to take off her shoes when she paid a visit to the Shri Swaminararyan Hindu Temple in North London. Diana respectfully removed her shoes before entering the temple, where she was welcomed with open arms. She spent a considerable amount of time getting up close and personal with everyone there. It’s customary at Hindu temples to remove your shoes since footwear carries dirt. Practitioners and visitors are asked to remove their shoes to maintain cleanliness out of respect, since it is a holy place. Princess Diana was warm and relaxed in her private life, as evidenced by this intimate family photo. This particular photograph belonged to a collection of photos allegedly taken by Prince William and Prince Harry on a camera they borrowed from their family friend’s nanny. 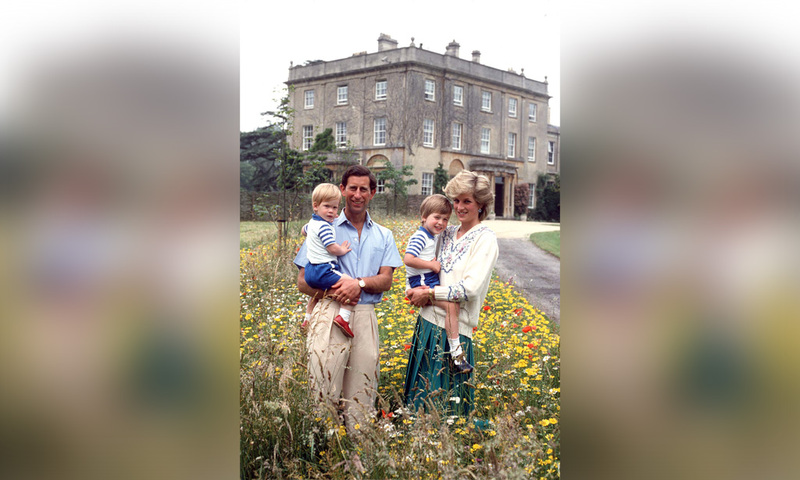 The photos were taken when Diana’s close friend Carolyn Bartholomew visited the family’s Highgrove estate in 1989. 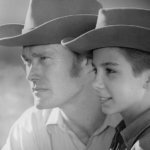 The Bartholomew’s nanny, Mary Bruce, kept the photos ever since and bequeathed them to a family friend upon her death, who then decided to share the photos with the world in 2007. 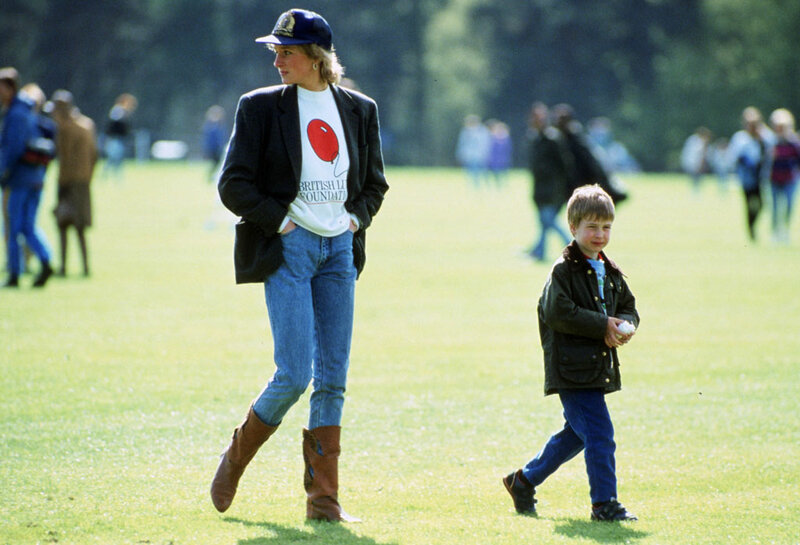 Princess Diana’s love for her sons was never questioned and everyone could see it. She was a positive influence during their upbringing but unfortunately, she was grasped out of their lives without warning. 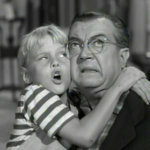 Still, William and Harry live by their mother’s influence to this very day. “My mother took a huge part in showing me an ordinary life, including taking me and my brother to see homeless people. Thank goodness I’m not completely cut off from reality. People would be amazed by the ordinary life William and I live,” Prince Harry told Newsweek in 2017. Here, a photographer snapped a candid shot of Diana. This was taken at a desert picnic in Saudi Arabia in November 1986, as she and Charles were on a Royal tour of Saudi Arabia. This blue floral outfit is yet another by favored designer Catherine Walker. 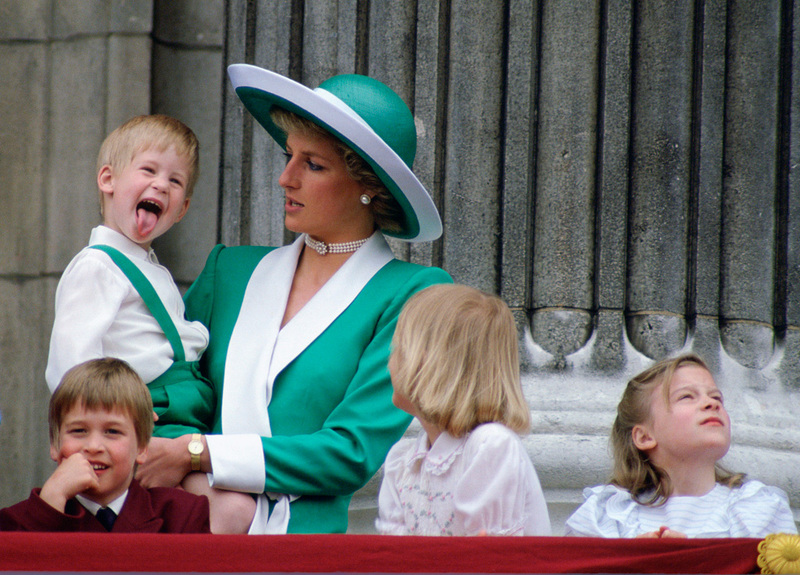 We’ve already seen just how much Diana loved her children, and this photo further cements that sentiment. In the snapshot, the princess holds her arms wide open, ready to hug Prince William and Prince Harry. This special image was captured on the deck of the yacht Britannia in Toronto. William and Harry went along with their parents on an official visit to Canada, 23rd October 1991. The stunning red-and-white checked suit that Princess Di is wearing was by fashion house Moschino. Diana liked to keep herself fit, but we rarely got to see photos of her in workout gear. Unlike her daughter-in-law the Duchess of Cambridge, who has frequently been photographed in athletic gear, it wasn’t common to see Diana in such casual attire. Here, she’s in simple shorts and a Virgin Atlantic sweatshirt as she leaves the Chelsea Harbour Club in London in 1995. Her charming smile indicates that she must have had a good workout! 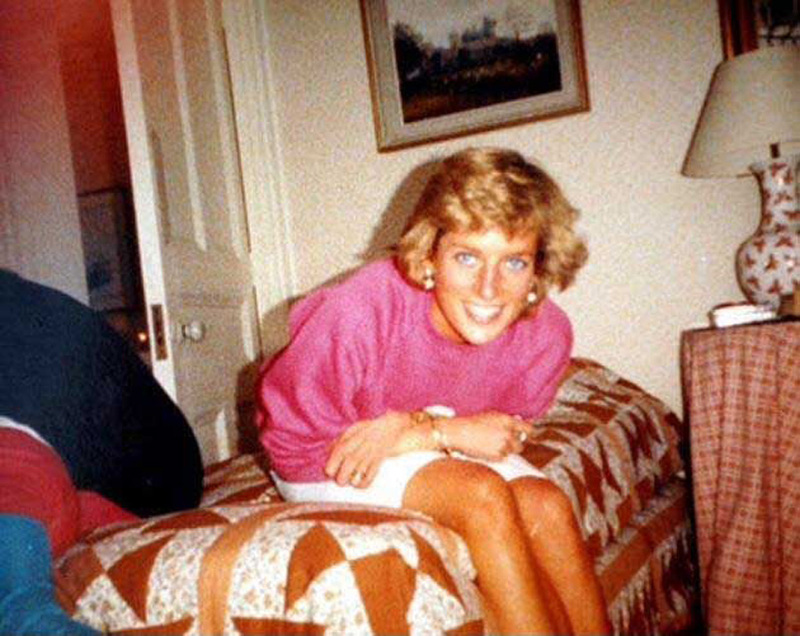 This is another incredibly rare and candid snapshot of Diana. It was snapped while she was on vacation in the South of France. She’s sporting a cute floral bikini and she has a matching cover-up in hand. It’s a comfort to those of us who admired her so much to see these candid shots of her relaxing while she was away from the public eye. This photo was taken in 1985 while the family was on holiday. Diana’s sister-in-law was Sarah Ferguson. Although many accounts state that the two royal women had a “complicated” relationship, this photo tells a different story. 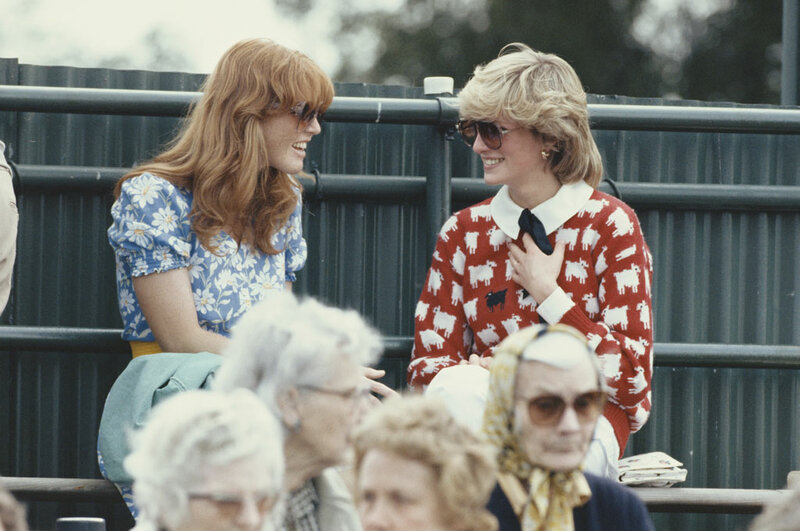 Here’s Diana chatting it up with Sarah at the Guard’s Polo Club in Windsor, in June of 1983. Sarah would go on to marry Prince Andrew and become the Duchess of York in 1986. Diana’s cute and casual sweater was from a London shop called Warm And Wonderful. He continued, “we’d tried to push forward a ban on the use, production and export [of mines] and it was only when Diana decided to come on board that the British government declared a moratorium.” He added that a ban treaty was later signed, but sadly that day didn’t come until after Diana’s death. Always the devoted and dedicated mother, Diana even escorted her beloved sons to school every now and then. 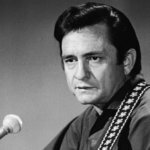 You could almost (but not quite) believe she was just a regular person at times. 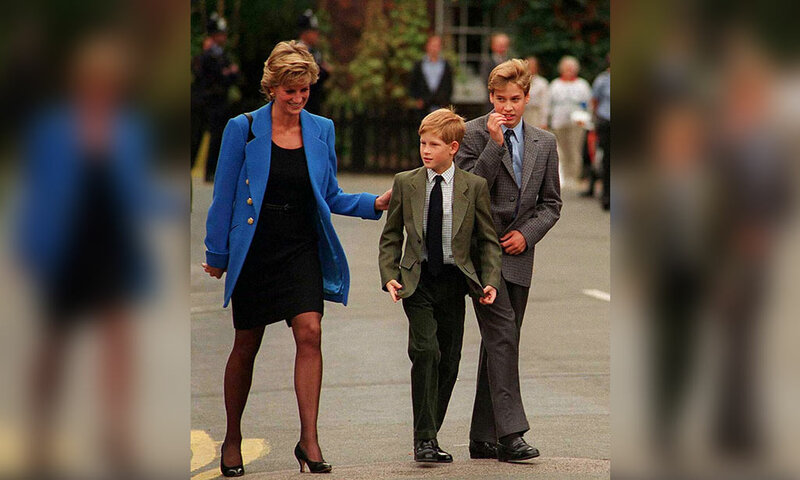 In this photo, Prince William arrives with Diana and Prince Harry for his very first day at Eton College on September 16, 1995, in Windsor, England. William looks pretty nervous about starting school – he’s even biting his nails! Luckily for us, there are quite a lot of pictures of Princess Diana with her children, being a very hands-on mom. This one shows Diana helping William out with a jigsaw puzzle. It was taken in 1985, in Willam’s playroom at the family’s residence in Kensington Palace. But in case you think she was a perfect mother, one of her former chefs later dished about her cooking skills to Hello Magazine: “She couldn’t cook, the Princess was a terrible cook. She really was. 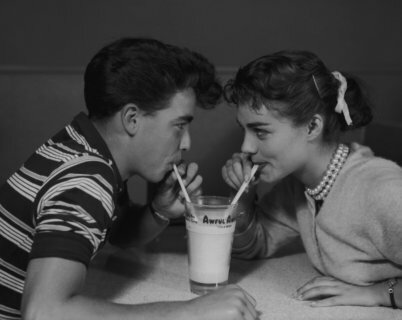 I would actually leave food for her,” he said. As we’ve seen time and time again, Diana was incredibly playful and loved to swim. She certainly caught some air with this elegant jump! People around the world loved, and still do love, Princess Diana. 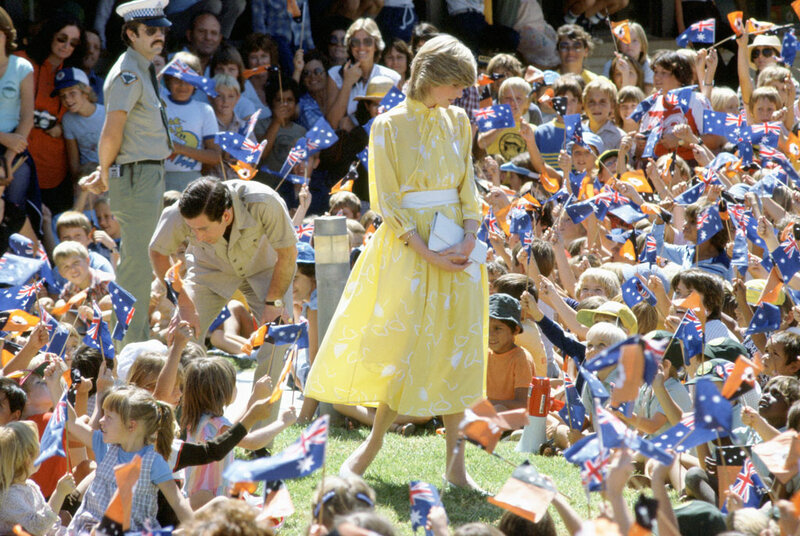 In this 1983 photo, the Prince And Princess Of Wales are greeting a large group of school children while they were on a visit to Alice Springs, Australia. This belted yellow dress is frequently cited as one of Diana’s most popular travel outfits. When Prince Harry and his new bride Meghan traveled to Australia in 2018, the Duchess wore some of Diana’s jewelry in tribute to her late mother-in-law. “One adviser cautioned her not to have anything to do with the media, a warning that supposedly shocked her.” In this photo, taken in France while she was attending an event called the International Night of Childhood, she waves to the paparazzi from the car she’s riding in. We’ve seen her in a sweatshirt before, and here’s another shot of her wearing one. This shows Prince William with Diana. They’re at Guards Polo Club, and the Princess’ shirt bears the British Lung Foundation’s logo on the front. She’s paired the shirt with a blazer, blue jeans, knee-high boots, and a baseball cap. Even when she was dressed casually she always looked perfect for whatever occasion or event she was attending. Ever the humanitarian, Diana worked with dozens of charities during her brief life. In this photo, we see her shaking with a resident of Casey House, which is an AIDS hospice located in Toronto, Canada. This photo was taken in 1991. 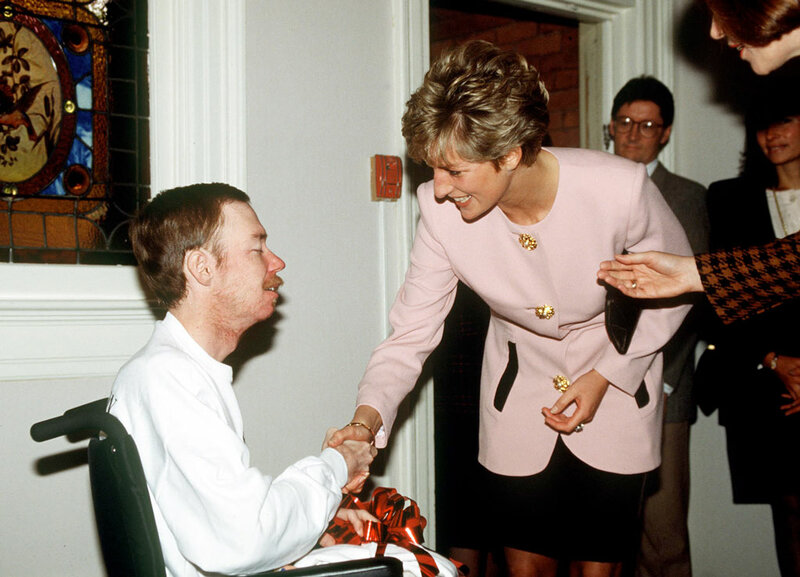 Years earlier, Diana met with another AIDS patient and shook his hands without gloves, which startled the world and challenged the world’s (then incorrect) opinion of how the disease was spread. Here’s a touching photo of Princess Diana, beaming as she leans in to embrace a woman in the crowd. This was shot on the streets of Carmarthen, Wales, on October 29th of 1981. 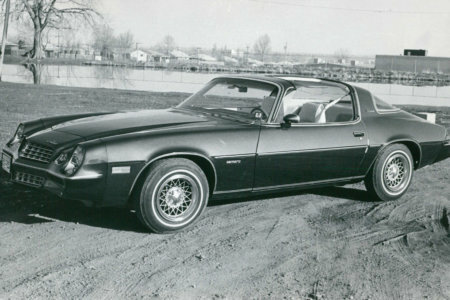 She had become a princess just three months earlier. Compared to the 750 million viewers worldwide who had tuned in to watch her wedding on television in July, this gathering on the street must have seemed very small. Diana once said, “I would like to be a queen in the hearts of the people.” She certainly is, and in this 1983 photograph looked stunningly regal. 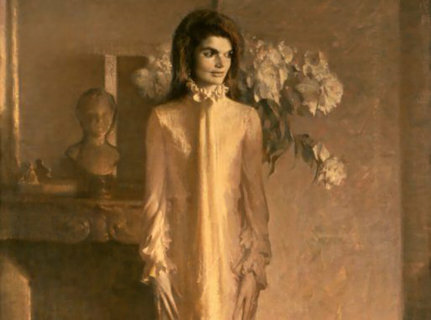 She’s wearing a cream-colored Gina Fratina gown at a farewell banquet in Aukland, New Zealand. The look was topped off with a pearl tiara and dropped earrings. Known as the Lover’s Knot tiara, the elegant headpiece has been worn several times by Diana’s daughter-in-law Kate Middleton, the Duchess of Cambrid. This 1968 photo shows Diana posing with her younger brother Charles, Viscount Althorp, at their Berkshire home. 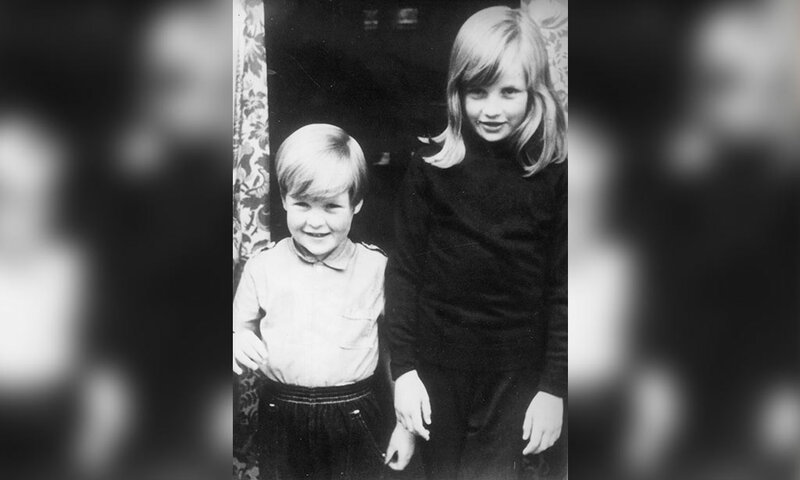 Also known as Earl Spencer, he and Diana had two more siblings, sisters Sarah and Jane. 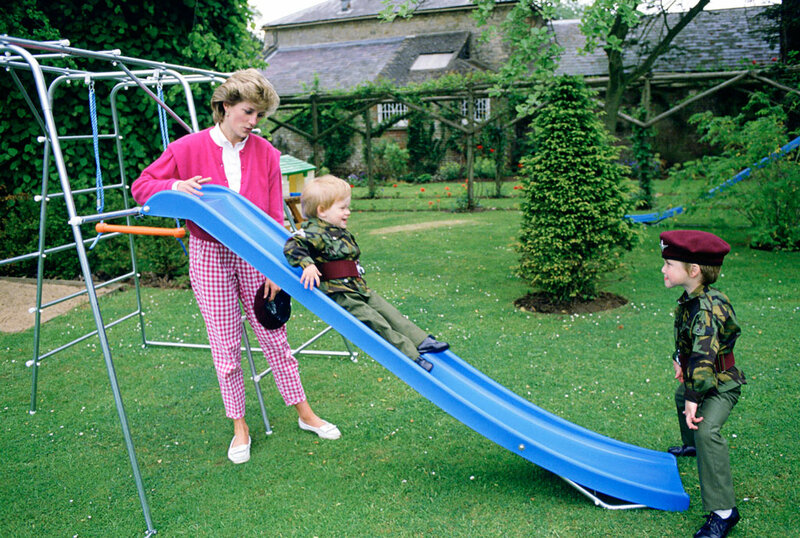 Here’s a cute picture of Princess Diana playing with William and Harry at their home, Highgrove. The boys are dressed in miniature Parachute Regiment uniforms for their playtime in the garden. Of raising the two princes, Diana once said, “I want my boys to have an understanding of people’s emotions, their insecurities, people’s distress, and their hopes and dreams.” If their adult lives are any indication, she certainly accomplished her parenting goals.